More than 250 medical experts have signed a letter condemning the US for force-feeding prisoners on hunger strike at Guantanamo Bay, Cuba. The experts, from seven nations, said physicians at the prison had to respect inmates' right to refuse treatment. The letter, in the medical journal The Lancet, said doctors who used restraints and force-feeding should be punished by their professional bodies. 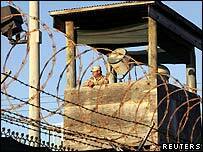 Some 500 terror suspects are being held without trial at Guantanamo Bay. 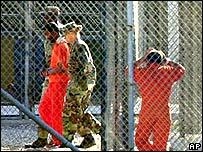 The US has argued that the Geneva Convention does not apply to prisoners at the camp, who, it says, are enemy combatants who continue to pose a threat to national security. Human rights groups and the UN have urged the US to close down the facility. Amnesty International said the "troubling" accusations in the doctors' letter underlined the need for the "independent medical examination of the prisoners". The open letter in the Lancet was signed by more than 250 top doctors from seven countries - the UK, the US, Ireland, Germany, Australia, Italy and the Netherlands. "We urge the US government to ensure that detainees are assessed by independent physicians and that techniques such as force-feeding and restraint chairs are abandoned," the letter said. Send us your views: Should Guantanamo close? The doctors said the World Medical Association - a world body representing physicians, including those in the US - specifically prohibited force-feeding. They said the American Medical Association, a member of the world group, should instigate disciplinary proceedings against any members known to have violated the code. Detainees at the camp have said hunger-strikers were strapped into chairs and force-fed through tubes inserted in their noses. Former inmate Mundah Habib told the BBC he stopped eating because drugs were put in his food. "As soon as I had the food I found I was a different person," he said. He said the hunger strike was the only way to "send a message to the public outside to know what's going on". More than 80 inmates are said to have gone on hunger strike in December last year - a figure that has now reportedly dropped to four. Dr David Nicholl, a UK neurologist who initiated the Lancet letter, told the BBC's World Today programme that US doctors going to Guantanamo Bay were being screened to ensure they agreed with the policy of force-feeding. "In effect they are screened to make sure they don't have doctors with a conscience." Dr Nicholl said it was the patient's decision to go on hunger strike and the doctor's responsibility was to explain the consequences and confirm the patient was sane. In February, Lt Col Martin, chief military spokesman at the US detention facility, said force-feeding was administered "in a humane and compassionate manner" and only when necessary to keep the prisoners alive. But Dr Nicholl said that "horrible as it may sound" the doctor had to conform to the wishes of hunger strikers, even if it led to their deaths. Dr Nicholl said the letter's signatories felt there was not enough publicity about the matter in the US media and that Americans needed to be challenged. He said the definition of torture issued at the camp in 2002 as actions that caused only "death or major organ failure" was "not a definition anyone on the planet is using".